The M/V Aiviq icebreaker, contracted by Shell Oil to support drilling in Alaska’s Chukchi Sea, is scheduled to be completed by Louisiana-based Edison Chouest Offshore in early 2012. The vessel, ordered in July 2009, is on track for April 1, 2012, delivery in Galliano, La., and will then head north, according to Shell Oil spokesman Curtis Smith. The $200m Aiviq is the largest vessel ever built by Chouest, and will be among the most advanced and powerful, non-military icebreakers on the waters. Lonnie Thibodeaux, Chouest spokesman, said the vessel's hull was scheduled to leave the company's North American Shipbuilding yard in Larose, La. on Dec. 20 for its LaShip yard in Houma, where the bridge is being built for final assembly. The Aiviq will travel though the Panama Canal to Alaska this spring. In order for a ship to be “ice class,” the hull must be thick, and extra girders, beams and bulkheads are needed for structural integrity. The Aiviq is designed to American Bureau of Shipping A3 capabilities to operate in frigid, minus-40-degree Fahrenheit temperatures, and can slash through a meter of ice with 20 centimeters of snow at 5 knots, Smith said. 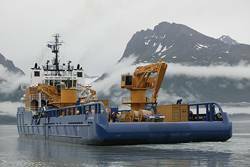 Crafted specially for harsh winter conditions, the ship can also work in Alaska the rest of the year. The vessel is being built to International Maritime Organization's Polar Code 3, and measures 111.8 m long, with a 22-m beam and 22-m draft. “It has hybrid generators, noise-reduction equipment, and meets or exceeds the U.S. Environmental Protection Agency's Tier 4 emission standards,” Smith said. The Aiviq can hold thousands of barrels of oil. And because it will be stationed far from medical facilities, the vessel will have a hospital on board. Building the icebreaker has kept more than 600 workers busy in south Louisiana, helping a region hit hard by an offshore drilling moratorium in the summer and fall of 2010, following the BP spill. And the Aiviq is expected to create over 100 jobs in Alaska, according to Shell. “Like other vessels in the Chouest fleet, we designed the Aiviq, built it and will operate it,” Thibodeaux said. “We will crew the Aiviq, and personnel from Shell will be on the vessel too.” The icebreaker can accommodate 65 staff in cruise-ship-like quarters. While South Louisiana, which seldom sees snow, may be an unlikely place to produce icebreakers, Thibodeaux said “we built the Nanuq ice-class supply vessel for Shell in 2007 and have also built two icebreakers for the National Science Foundation.” The Nanuq was outfitted with oil-spill-response capabilities well before the 2010 Macondo spill in the Gulf, he noted. The Aiviq is designed to work in tandem with the Nanuq. Thibodeaux explained that Aiviq means walrus in the Inupiaq language, and was named by a 12-year-old girl in Nuiqsut, Alaska in a contest sponsored by Shell. Prior to that, the Nanuq, meaning polar bear in Inupiaq, was named by residents of the village of Kaktovik. The Aiviq is designed with the habits of marine animals in mind. “We're being as proactive as possible in an effort to reduce our overall sound footprint,” Smith said. “Insonification is a significant issue for stakeholders who rely on marine mammals for subsistence hunting.” Man-made noises disrupt mammals communicating via the emission of sounds in water, often at great distances. Smith said Shell has long worked with the assistance of ice-class vessels offshore. “Shell drilled the majority of the wells in the Beaufort Sea in the 1980’s and 1990’s, and drilled four of the five wells ever drilled in the Chukchi during that same period,” he said. Shell plans to drill new wells in the Beaufort and Chukchi seas in 2012 and 2013. The company has invested billions in Arctic leases since 2005 but ran into opposition from environmentalists and native Alaskan groups. Last August, however, Shell received a Bureau of Ocean Energy Management conditional permit to explore for oil in the Beaufort Sea, east of the Chukchi. In October, the EPA issued a final air-discharge permit sought by Shell to drill in the Beaufort Sea. With that air permit, Shell can use its Kulluk rig for 120 days a year in Arctic waters, the agency said. In mid-December, BOEM conditionally approved a revised, Shell plan to drill six, oil-exploration wells in the Chukchi Sea next year. Together, the Beaufort and Chukchi seas could hold 27 billion barrels of oil and 132 trillion cubic feet of natural gas, according to the U.S. Geological Survey. In comparison, 17 billion barrels of oil have flowed out of Alaska's Prudhoe Bay fields in the past 30 years. Icebreaking in the U.S. dates back to the 1830's for clearing harbors in East Coast ports. After the U.S. purchased Alaska in 1867, the Coast Guard --then called the Revenue Marine or Revenue Cutter Service--began to deal with icy Alaskan waters. In this decade, as climate change causes polar ice to melt, more traffic is expected in Arctic waters. Global warming has opened up the Arctic in the summer, expanding the time that drillers and international shippers can operate without risking ice collisions. Last summer, Coast Guard commandant Admiral Robert Papp warned that if a big oil spill were to occur in the Arctic, the U.S. lacks the infrastructure and equipment to respond quickly. The Coast Guard says that it needs more heavy- and medium-duty icebreakers though paying for them is a challenge. Companies need more vessels to smash through ice too. For now, foreign vessels are allowed to work in frigid U.S. waters under a Jones Act exemption that expires in 2017.